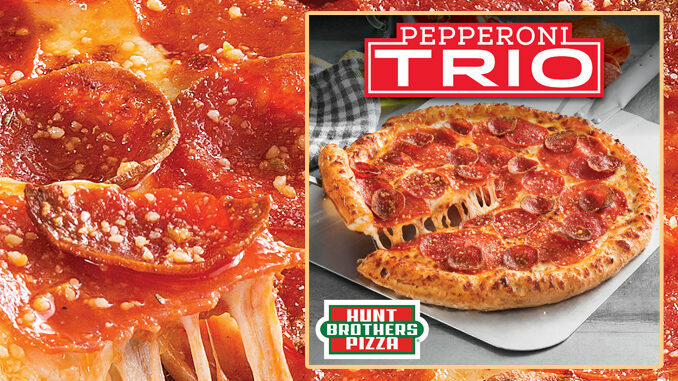 For a limited time starting October 8, 2018, Hunt Brothers Pizza will introduce their newest limited time offer: Pepperoni Trio Pizza. The Pepperoni Trio Pizza features an original crust topped with signature pizza sauce, 100 percent Mozzarella cheese, giant pepperoni slices, traditional pepperoni and crispy pepperoni. The pizza is finished with the brand’s signature Just Rite Spice prior to baking. The new LTO will be available at participating Hunt Brothers Pizza retailers in two sizes – a large 12-inch whole pizza or a Hunk A Pizza, which is one-quarter of a 12-inch pizza. Hunt Brothers Pizza is America’s largest brand of made-to-order pizza in the convenience store industry.